The Islamic State (also known as ISIS) has claimed that a newly released audio recording contains a message from Abu Bakr al-Baghdadi, the leader the jihadist group. The recording comes just days after Baghdadi was reportedly injured in a US airstrike. It appears to be genuine, according to the security firm Flashpoint Intelligence. The SITE Group also confirmed that the Islamic State released the message. The audio is the highly secretive leader’s second such message, and his first since a July 5 video of him delivering a sermon at a mosque in Mosul. The audio recording could be ISIS’s attempt at proving that Baghdadi survived the US strike on Nov. 9. But the fact that the message has only been released in audio form raises doubts as to how injured the airstrike may have left him, and makes it difficult to immediately confirm whether Baghdadi is in fact the speaker on the tape. An unconfirmed translation released at the same time as the recording and bearing the flag of the Islamic State includes a few references to easily-datable events. Baghdadi mentions the Obama administration’s Nov. 7 announcement that it was dispatching an additional 1500 troops to Iraq. He also makes what might be an oblique mention of jihadist groups in the Sinai that have “burnt their ships,” a potential reference to a Nov. 13 attack on an Egyptian naval vessel in the Mediterranean. Crucially, there is no mention of the Nov. 9 airstrike in the recording. There’s a possibility that the recording in fact predates the airstrike and is being used to distract from Baghdadi’s actual state of health. 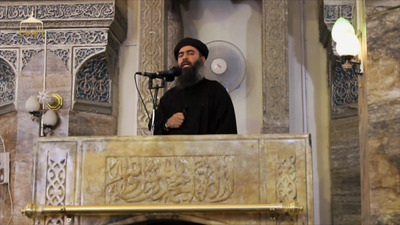 Elsewhere in the recording, Baghdadi emphasises his view that there is a religious obligation to join the fight in Iraq and Syria. At time he seems to openly bait the US into launching a ground war against him, and argues that the US-led coalition campaign against ISIS is in a state of disarray. “We see America and its allies stumbling between fear, weakness, inability, and failure. America, Europe, Australia, Canada, and their apostate tails and slaves from amongst the rulers of the Muslims’ lands were terrified by the Islamic State,” Baghdadi says.